Tonight is another Cruisin night in downtown Mesa. 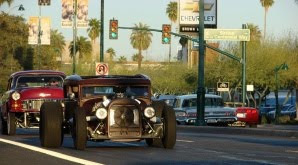 This free, monthly cruise is open to every make and model, and regularly fills Mesa's historic Main Street with more than 150 customs, hotrods and classics from across the Valley. Cruisers can park along side streets in the downtown area and along Center Street. At the corner of Center and Main, the Mesa City Plaza building's large parking lot and has become a favorite stop for participants to hangout between trips down the main drag. The "Crusin' on Main Street" event is held the 4th Saturday of every month and takes place on Main St. in Mesa, between Country Club and Mesa Drives.